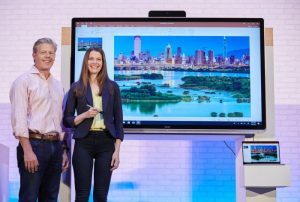 Microsoft has announced a new category of display that like the company’s own Surface Hub is designed to support collaboration and team-working and maximise the benefits of the Microsoft 365 eco-system. 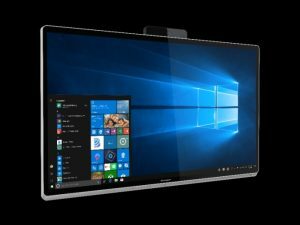 High resolution, interactive Windows Collaboration Displays feature multitouch and pen input; integrated stereo speakers; Microsoft-certified far-field microphones and cameras; built-in environmental sensors; and easy connectivity to any Windows 10 PC via a single USB-C connection. The first models, from Avocor and Sharp, are due out later this year. No pricing details were available at the time of going to press, but because they depend on a connection to a Windows 10 PC, they are likely to be cheaper than standalone, all-in-one devices like the Microsoft Surface Hub. Angela Evans, Microsoft 365 Lead at Microsoft UK, says that Microsoft is bringing out the displays in response to changing work styles. Mark Mason, Avocor VP of Sales, EMEA, also highlights the shift from what he calls ‘me work’ to ‘we work’, where teams in the same office or multiple locations work together at the same time or asynchronously. The same could be said about any large, interactive display, so what’s so special about Windows collaboration displays? For Evans, it’s their compatibility with Microsoft 365. “What makes Windows collaboration displays unique is that they bring together the Modern Workplace and PC desktop experience, allowing users to make the most of Microsoft 365 apps and experiences at room scale. 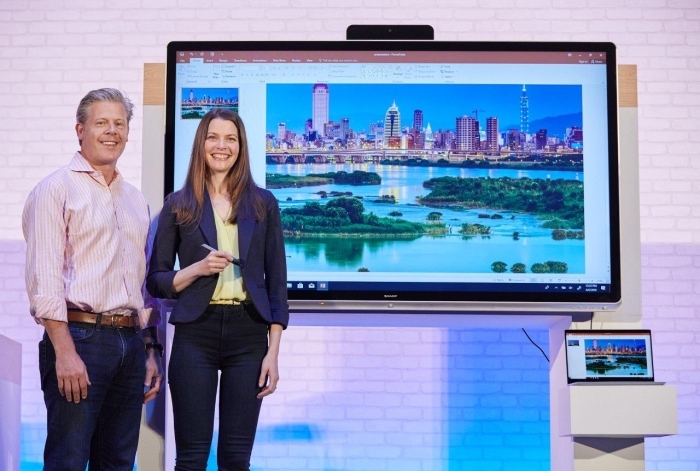 Users can be more productive because the collaboration display empowers them to connect with their own PC, which already has all the apps and content they need on it,” she said. Jason Cort, director of product planning and marketing at Sharp Europe, also highlights easy access to the Microsoft tools users know and love, such as Office and Microsoft Teams. Another distinctive feature of the displays, says Avocor’s Mason, are built-in sensors that capture environmental and usage data that facilities managers can use to optimise their workspaces. “That data can include what time meetings start; if they end early; peak utilisation times; room temperature; how many people attend a meeting; and many other things. All of this information can help managers make decisions about heating and cooling in particular areas and identify if rooms are under or over-utilised as meeting spaces, if a room is too large or too small to serve typical meetings and requires modification, and many other drivers toward maximum ROI around facilities,” he said. Angela Evans adds that by incorporating sensors that can connect to Azure IoT, Microsoft is making it easier for partners to develop solutions for customers (see below). “One growing area of opportunity for IoT is in smart buildings, to create greater efficiencies in energy use and to create environments that best fit an organisation’s culture. We’re building spatial intelligence capabilities in Azure IoT to democratise smart spaces for our partners. These features enable partners to focus on innovation at the application level, instead of spending considerable time on foundation and connective tissue that is invisible to their customers. The ability to query data in the context of a space, rather than from disparate sensors sets our partners up for building repeatable and scalable solutions, now and in the future,” she said.